The United Society of Believers in Christ’s Second Appearing, more widely referenced as the Shakers, are well-known for their furniture today, especially their chairs. As new “Believers” joined their community, they brought popularly styled Federal period furniture with them and in turn influenced what the Shakers made for use in their homes going forward. The most recognizable style of Shaker chair is the traditional slat- or ladder-back version, but there were actually many types including those with Windsor styling and a rotating chair also known as a revolver. And, of course, there’s the widely recognized Shaker rocking chair. The largest and most influential community of Shakers was established at New Lebanon, New York in 1787. This community remained active until 1947, according to the Metropolitan Museum of Art in New York, which holds an impressive collection of Shaker furniture and home furnishings. It’s interesting to note that the New Lebanon branch was the only one that made chairs available for sale to the public as a means to support the community. 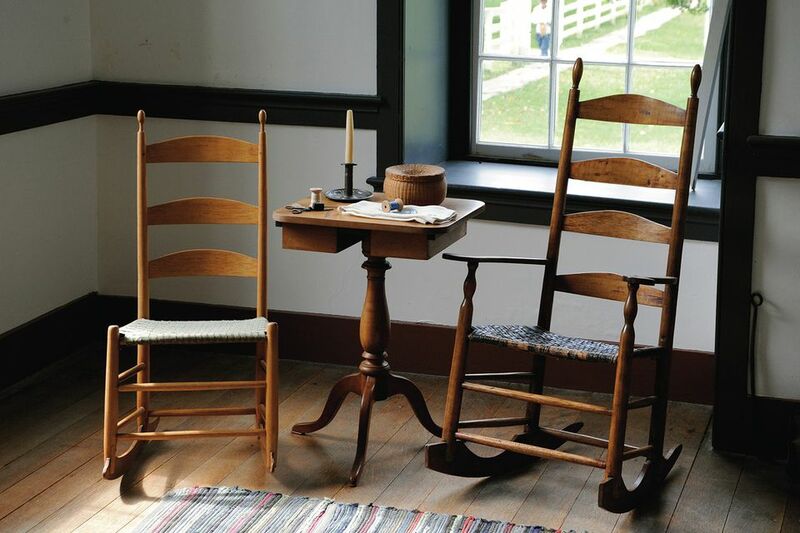 Other Shaker villages made furniture, including chairs, solely for use in their homes and businesses and trade of these items remained within the confines of the communities. The Shakers produced the bulk of their furniture from 1820 to 1870, and continued producing chairs through the remainder of the 1800s. By 1900 the community had drastically declined in numbers, and very little furniture was made thereafter. Chairs made by the Shakers followed form based on simple 18th-century designs, primarily Federal influences, including those seen in their Windsor and slat-back chairs. These chairs also had simple turned posts and woven seats. They lacked ornamentation by and large, as prescribed by the sect’s founder Mother Lee, although a good number of them were painted when they were first made. Extraneous ornamentation and elements imparting comfort were considered inappropriate due to the strict religious beliefs of the Shakers. The talent of the Shakers was exemplified by simplifying and refining. They removed “all artifice and adornment” to design furniture that served basic needs quite well. Subtle differences in the styling help furniture historians identify authentic Shaker pieces and assist in pinpointing their origin. In addition to traditional ladder-back side chairs, the Shakers modified these styles to make them more functional over time. For instance, some early “tilter” chairs were made with back legs cut at an angle so the chair naturally tilted back against a wall. This provided more stability when the chairs were leaned back against home or meeting room walls to make the occupant more comfortable. Later chairs were made with tilting mechanisms invented by the New Lebanon community built into the chairs to make them even more serviceable although the styling overall remained plain and simple. Rocking chairs made by Shakers living in New Lebanon were often characterized by oval finials, round hand grips, and the shape of the rocker blades which almost look like wooden machetes when viewed from the side. Another interesting side note is that rocking chairs were utilized primarily by the elderly and ill in households until after the American Revolution. The New Lebanon Shakers made them for use in their own homes, and like their other chair styles, marketed them to outsiders as well. Shaker chairs were touted as having great attention to detail and quality at a time when more and more mass-produced furniture was being made. They are indeed nicely crafted pieces of furniture that have stood the test of time. These utilitarian items were solidly built while being light in weight so that they could be hung on pegs for storage when not in use and transported by the Shakers, even children, as needed. Interestingly, as far as the Shakers were concerned, hand making quality furniture didn’t mean that modern machinery was not used in its construction. According to the Metropolitan Museum of Art, many pieces of Shaker furniture were made with circular saws, steam-powered lathes and other mechanical devices. The Shakers were the original “work smarter, not harder” craftsmen, and their legacy endures more than a century after most of their goods were sold.